is a trademarkused under licence from The De Beers Group of Companies. Currently,There is no KARP TENDER. 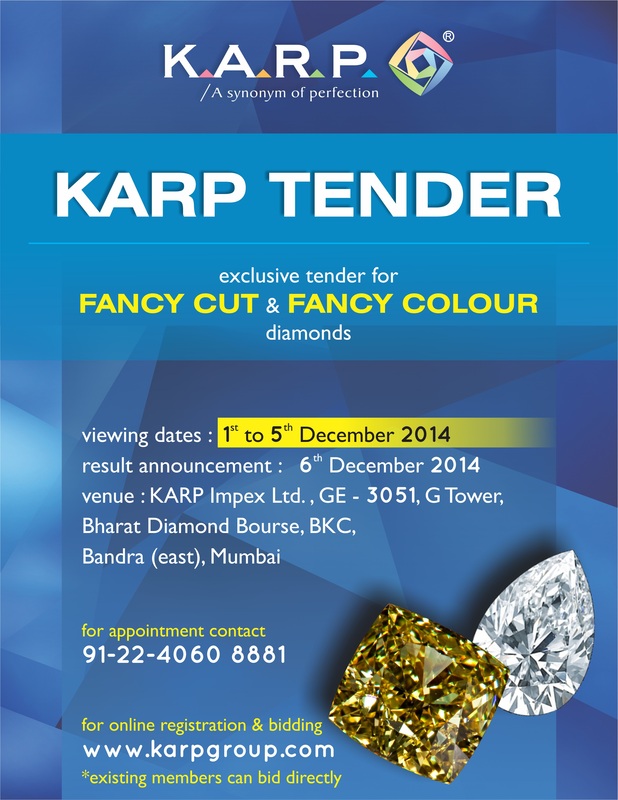 we thank you for showing interest in KARP TENDER. Time : From 09:00 am To 06:00 pm. Results will be announced on 13-04-2015. 1 : The Bid Price(s) will be accepted ONLY for NET ADVANCE PAYMENT terms. 2 : Price(s) mentioned are speculative, you may bid the SAME or ABOVE or BELOW. 3 : Bids on NON-CERTIFIED PARCEL GOODS will be accepted on WHOLESALE basis only. 4 : Bids will be accepted ONLY for INDIVIDUAL parcel. 5 : Stones can be bought instantly at our existing Price(s). 6 : The Rapaport for 10th April 2015 will be applicable over final result. 7 : Final bids CANNOT be changed after the closing of tender.